Clark W. Anderson died peacefully at age 93 on October 25, 2018 in Casper, Wyoming. No service is planned at this time but all information will be available on this website. Newcomers is handling all of the arrangements for the Anderson family. Clark was born in Clearwater NE, the 4th of 11 children on June 27, 1925 to his parents Clark Cecil and Verna York Anderson. He grew up on the family farm in Nebraska and attended rural schools there graduating from high school a month before his 17th birthday. Clark was on his way to Japan to participate in the invasion of that country when President Truman ordered the bombs dropped that completely ended WWII. With that piece of history, it is our belief that he and his loving wife Avis got to enjoy 66 years of marriage together. After he left the service in 1946, he returned to his home in eastern Nebraska where he worked on a threshing crew. 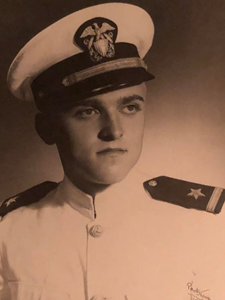 A Navy friend asked if he would like to teach in Kilgore, NE and his reply was “Anything would be better than this!” That began his teaching career and Kilgore happened to be Avis’ hometown. Avis moved to Casper in 1950 and Clark soon followed. They were married in 1952. His first job in Casper was with Montgomery Ward where he earned $42.50 a week. He then worked for the C&NW Railroad for 15 years. After completing his Bachelors degree at the University of Wyoming, he began teaching 8th grade math at CY Junior high in Casper. He would go on to earn a Masters degree in Math and Physics all while raising a family. In 1970 the Andersons moved to Guam for two years where Clark taught in a local junior high, coached volleyball, completed administrative courses at the University, hitch hiked to school every day and did adventurous things with his family on weekends including hiking through the rain forest, beach combing for glass fishing floats and many other fun activities. Lifelong friendships were developed there and wherever Clark had roots. Two and a half months of international travel through Asia and Europe concluded the stay on Guam for the family. Upon their return to Casper in 1972, Clark went back to CY and began his work as Assistant Principal. He always truly enjoyed his students and colleagues. He retired at age 63 and enjoyed a full 30 years of retirement. He and Avis spent 26 years in a very close knit community in Mesa, Arizona as Snowbirds and enjoyed those years tremendously. They square danced, attended many community events and enjoyed family and friends who visited often. Clark loved Avis and family above all. He was a hardworking, smart, kind and gentle soul. He had a great sense of humor. He loved to play cards, grow an organic garden, to fish, take the family camping in the wilderness of Wyoming and have fresh trout for breakfast. He was able to work on cars, fix things around the house. After the return from Guam he built a house from the ground up on Jackson Street in Casper just to see if he could. This was in his spare time after work and with the help of Avis. Clark and Avis worked very hard all of their lives to rise above their humble beginnings, provide a good life for their children, put each other through college and save for a comfortable retirement. He loved Wyoming football and the Broncos. Our house was often the gathering spot for us and our friends in the neighborhood because it was safe, secure, fun and tolerant. He loved people and was the nicest man you could ever know. Clark always had time for a chat with his kids or a neighbor. Clark is survived by wife Avis Ann Hill Anderson, his daughter Roxanne Mitchell and husband Jim of Mesa AZ and Anchorage AK and their two boys Spencer and Alex. Their son Calvin and his wife Ginger live in Jackson WY and have two boys Keane and Gabe. Clark was preceded in death by sisters, Lara Anderson, Verna Petersen, Ardis McDaniel, and Helen VanVleck and brother, Richard Anderson. He is survived by sister, Alta Heggemeyer and brothers Eugene “Bud”, Tom, Dean and Ron Anderson. To leave a special message for Clark’s family, please click the Share Memories button above. Add your memories to the guest book of Clark Anderson. The story of Clark's life is a wonderful, heart warming read. What a marvelous man he was. He was hard working, very smart, adventurous, a wonderful father and provided so well for his family. How lucky you were to have had him in your lives. I'm sure you will receive great comfort in the many happy memories of your time with him. I was sorry to learn of the passing of Uncle Clark, he will be greatly missed. I enjoyed visiting with him and will miss hearing his stories. I remember a visit from Clark, Avis, Roxanne and Calvin in Gelnhausen Germany when they were returning from Guam. During a visit to our home in Townsend, Montana, Clark told my Dad that Clark did not think he could drive a semi. The next summer when we were visiting in Buffalo, Clark stopped and visited with us after delivering a load of gas to the Texaco station in Buffalo. Sending hugs and prayer to Avis and family. Dana, Bob, Krystal and Mike all want you to know we have wonderful memories of Clark. Especially Dana when he spent time visiting with Avis and Clark in Arizona. I was so sorry to hear about Uncle Clark! He was a very special man and I loved hearing his stories! He will be missed! Hugs and Love to you All!